The stress regime across the Hellenic subduction zone was investigated by performing stress inversion on 100 intermediate-depth moment tensor solutions. In this study, the slab was divided into four sectors based on earthquake distribution, trench geometry, and the results of a previous study of slab geometry. For the Peloponnese sector, moment tensors reaching 80 km depth were inverted, and the slab stresses were compatible with a possible slab tear. For the Kithira-Western Crete and Crete sectors, homogeneity was observed at depths up to 100 and 80 km, respectively. For these two areas, the subvertical σ3 and along-strike σ1 justify slab rollback as the driving mechanism. The differences in the stress regime and azimuth of the maximum compression of these two sectors may reflect a bulge in the slab. For the fourth sector, Karpathos-Rhodes, two distinct subsectors were defined along a depth gradient (50–90 km and 90–180 km, respectively). The strong heterogeneity observed at both depths and changes in the stress regime from slab pull to extension may be an indication of a doubleWadati-Benioff zone. The membrane strain model presented here can provide a possible explanation for the along-strike compression observed at the top 90 km in three of the four sectors. The Southern Aegean is located on the convergent boundary of two tectonic plates, namely, the Eurasian and African plates (e.g., Jackson and McKenzie, 1988) (Fig. 1). A Wadati-Benioff zone (WBZ) identified by seismicity down to a depth of 150–180 km, is created by the subduction of the African lithosphere at a rate of about 1 cm/year and the motion of the upper Aegean plate towards the SW at a rate of 3.3 cm/year (e.g., Reilinger et al., 2006; Rontogianni, 2010). Seismic tomography data show that the subducting lithosphere can be traced down to about 1200 km (e.g., Bijwaard and Spakman, 1998). Several investigators have attempted to explain the complicated stress patterns present in the Hellenic subduction zone, but the limited data available to date has frustrated all such attempts to define a clear model. Kiratzi and Papazachos (1995) examined the deformation caused by 12 intermediate-depth earthquakes (40–100 km). On the basis of seismicity and moment tensor data, they showed that the angles at which T-axes dip to the inner side of the Hellenic arc are generally steeper than that of the slab dip. The P-axes appeared to be more variable and almost horizontal (6°–10°), parallel to the strike of the arc. Benetatos et al. (2004) used 22 intermediate-depth focal mechanisms and concluded that the distribution of T-axes shows shortening roughly parallel to the arc. The P-axes followed the trend of the arc in the eastern part, but at the western part this was not so clear. Map of the Greek region showing the epicenters of the intermediate depth earthquake activity. Continuous red lines indicate the cross-sections described in Fig. 2. The thick green arrows indicate the plate motion direction along with average rate of convergence per year after Reilinger et al. (2006). The black triangles are the active volcanoes. The dark red curves for 20, 100 and 170 km are isodepth curves showing the hypocentral depth distribution of earthquakes occurring along the Wadati-Benioff zone. PL: Peloponnese, CR: Crete island, KP: Karpathos island, KT: Kithira island, RH: Rhodes island, KF: Kefalonia Fault, and NAF: North Anatolian Fault, CHSZ: Central Hellenic Shear Zone. (for a color version of the figure the reader is referred to the online version of the article). Cross-sections of the earthquake foci along the subduction zone for each of the four sectors-domains shown in Fig. 1. A-A′ Peloponnese, B-B′ Kithira-Western Crete, C-C′ Crete, D-D′ Karpathos and Rhodos. The moment tensors for each domain used for stress inversion are presented along the profiles. (for a color version of the figure the reader is referred to the online version of the article). The aim of the study reported here was to perform stress inversion on moment tensor solutions of intermediate-depth earthquakes (50 km ≤ depth ≤ 180 km). The stress field parameters were determined along the arc for several depth ranges. The slab was first divided into sectors, each containing a sufficient number of focal mechanisms for stress inversion to be performed successfully, and then subduction-related seismicity (40 km ≤ depth ≤ 180 km) was identified for each segment using data selected from global and local seismic catalogs. The results provide an updated view of the geometry for the Hellenic WBZ. The main issues addressed in this study are: (1) How does the slab stress vary horizontally and vertically along this large curvature arc? (2) Which mechanisms, as inferred from global observations, can explain this stress pattern? For the purposes of this study we created two catalogs: (1) a database of intermediate-depth fault mechanisms and (2) a database of intermediate-depth earthquake activity recorded up to June 2010. We collected data from various published studies as well as from global catalogs available through the World Wide Web. In order to avoid any inter-plate interaction for the selected moment tensors, we set the shallowest depth to 50 km; for the second catalog, depth was set to 40 km. The first catalog contained reported data from local, regional, and global networks and covered different time intervals. Non-uniform methods were used to determine the fault plane solutions (the reader is referred to each study or web page). For this reason, we applied quality control criteria during the selection of the events when it was not done in the original study. The final catalog included 100 moment tensors, the largest ever dataset selected and used for stress inversion in the Hellenic area to date. We used the Engdahl et al. (1998) locations for any of the 100 events that could be found in the Engdahl global relocation database. The National Observatory of Athens (NOA) database, from which 52 events were selected. The 41 solutions between 2001 and 2006 are included in Konstantinou et al. (2010); the 11 solutions for the period after 2006 are available at http://bbnet.gein.noa.gr/NOA HL. The inversion procedure as well as the quality characterization of focal mechanism solutions based on average misfit and compensated linear vector dipole (CLVD) amount are described in Konstantinou et al. (2010). The selected events had an average waveform misfit smaller than 0.5 and an average CLVD of approximately 40%. Bohnhoff et al. (2005), from which nine mechanisms were selected, namely, only the most reliable as described by Bohnhoff et al. (2005). Benetatos et al. (2004), from which six solutions were selected. Quality control had been performed by the authors of the original study, and the earthquake source parameters had a maximum error <30°. Global CMT catalog (http://www.globalcmt.org/CMTsearch.html), from which 15 solutions were included. The quality of these solutions was determined based on the criteria proposed by by Frohlich and Davis (1999). MEDNET INGV database (http://mednet.rm.ingv.it/rcmt.php), from which nine events were selected. Only events with quality flag A–B were accepted. SED (ETH Zürich) database (http://www.seismo.ethz.ch/prod/tensors/index_EN), from which four events were selected. Only events with quality A were accepted. EMMA database (Vannucci and Gasperini, 2004 (http://gaspy.df.unibo.it/paolo/ATLAS/pages/EMMAREAD_ME.html)), from which five events were selected. For moderate-to-large events (M < 5.5), the locations are constrained from the global relocation database of Engdahl et al. (1998) and its subsequent updates that extend throughout 2005. For smaller events (M ∼ 3.5), locations are taken from Papazachos et al. (2000). For events after 2006 and up to 31 May 2010 we used the NOA database (http://bbnet.gein.noa.gr/NOA_HL). The selection criteria here was (1) the event had to have been recorded by more than four stations and (2) the depth error had to be <5 km. The final catalog included more than 1100 events (Fig. 1). In order to study and evaluate the stress regime of the Hellenic WBZ, we applied the inversion technique of Michael (1987) to the earthquake focal mechanism catalog. The technique is not discussed here in detail, but the interested reader is referred to the articles of, for example, Michael (1987, 1991) and Hardebeck and Hauksson (2001). The algorithm uses the statistical method of bootstrap resampling and allows the three principal stresses (σ1 = maximum, σ2 = intermediate, σ3 = minimum) to be determined as well as a relative stress magnitude . The method also calculates the misfit between the best fit model and the data given by , the angle between the slip direction and the predicted tangential traction on the fault plane. Michael (1991) estimated the variation of as a function of the standard deviation of the errors in strike, dip, and rake of the fault plane solutions (FPS). For FPS errors varying from 10 to 25°, the misfit angle can range from 30 to 45° (Michael, 1991), indicating that stress inversion results with misfits lower than this are considered acceptable and that the stress field is approximately homogeneous. In order to divide the Hellenic subduction zone into sectors, we made use of all available information from previous studies that used different methods to investigate the slab. We divided our sectors on the basis of earthquake distribution, trench geometry, and results from earlier studies on slab geometry (Papazachos and Nolet, 1997; Konstantinou and Melis, 2008). We then applied the inversion method with the objective of using the maximum number of available focal mechanisms and including depths close to 180 km in the analysis. However, this was not possible since only one of the four sectors had a sufficient number (>12) focal mechanisms for depths below 90 km. Table 1 lists the number of input datasets, the depth ranges for each sector, the directions of the three principal stresses, the R value, and the average misfit . Profiles of the WBZ along each domain were plotted to examine their shape and geometry (Fig. 2). The best fit stress solutions and 68% confidence limits obtained by the inversion are presented as lower hemisphere projections in Fig. 3. Summary of stress inversion results for the different sectors mentioned in the text. For each stress axis (σ1, σ2, σ3) the resulting azimuth and plunge is given along with the value of R and the misfit angle . Total MT is the number of all the available focal mechanisms in each sector, N is the number of focal mechanisms used in each stress inversion. Map view of the distribution of the 100 focal mechanisms used in this study. The different color of the beach balls indicates the different sectors, blue—Peloponnese, green—Kithira-Western Crete, red—Crete, purple—Karpathos-Rhodos. For each sector we present lower hemisphere projections of the directions of the principal stress axes obtained from the datasets listed in Table 1 (see also text for more details). The square represents the σ1 axis, the circle signifies the σ3 and the triangle the σ2 axis. The colored dots define the 68% confidence region of each stress axis. (for a color version of the figure the reader is referred to the online version of the article). Stress inversion was applied to focal mechanisms at depths ranging from 50 to 80 km, leading to an acceptable misfit (∼47°). The misfit level shows that a small level of heterogeneity is present in the stress regime that might be caused by pre-existing faults of different orientation. The value of R is 0.45, suggesting that the stress regime is triaxial. The best stress model has a maximum compression σ1 trending 231° and is almost normal to the slab (dip ∼57°), while the minimum compression σ3 dips at 33° (Fig. 3). The minimum compression appears to be steeper than the slab if we accept a slab dip of around ∼30°, as suggested by Papazachos et al. (2000) or ∼21°, as reported by Suckale et al. (2009) (determined by backscattered P- and backscattered Sh-waves). The σ3 axis follows the slab if we accept a slab dip of ∼34° (apparent only on the S-mode images of the northern back azimuths in the Suckale et al. (2009) study). The dipping directions of the σ1 and σ3 axes suggest that the slab plane is under extension. If the σ3 axis is steeper than the slab, a component of slab-pull force is unbalanced by the subduction resistance. This unbalanced slab-pull force has been described by Scholz and Campos (1995) as the trench suction force, which contributes to the seismic decoupling at the plate interface. If we accept a σ3 axis along the slab, then no suction force is required. The focal mechanisms that gave well-constrained stress directions and a homogeneous stress field (acceptable misfit ∼30°) ranged in depth from 50 to 100 km. There were no available focal mechanisms below this depth. The orientation of the σ1 axis changes significantly when compared to that of Sector 1 and is almost along the strike (dip∼12°) trending 167° (Fig. 3). The stress regime is biaxial, i.e., of confined extension (R = 0.3). In this sector fewer than 12 events below a depth of 80 km were available for stress inversion estimation at two depth ranges. Papazachos et al. (2005) suggested that the lack of seismicity at depths between 90 and 140 km is a result of the high temperature, an indication that the primary magma in southern Aegean is located in the asthenospheric wedge between the descending Mediterranean and the overriding Aegean microplates under the volcanic arc. The best solution was given for depths between 50 and 80 m. The model misfit is around 30°, indicating a homogeneous stress field. The maximum compression is oriented, as in sector 2, along the strike (dip ∼ 6°). The minimum compression σ3 is almost subvertical to the slab orientation (dip ∼ 71°) (Fig. 3). The stress regime shows confined compression (R≈0.6). Applying the stress inversion for the whole depth range (50–180 km) resulted in a misfit of >45°, implying that the stress field is probably heterogenous and cannot be described by a single stress tensor. We divided this sector in two depth ranges: 50–90 km and 90–180 km, respectively. The shallow subset (50–90 km) shows a σ1 almost along the strike (dip∼7°) and σ3 shows a down dip (dip∼42°) (Fig. 3), implying the presence of slab-pull forces. R has a value of around 0.5, suggesting that the stress regime is triaxial. The deeper subset (90–180 km) has a different stress regime, with the σ1 slab vertical and σ3 parallel to the slab. R has a value of 0.3, suggesting that the stress regime is biaxial, i.e., of confined extension. For both depth ranges of this sector, the high inversion misfit points to the possibility that not a single stress tensor can describe the stress conditions within the slab. The results determined from the stress tensor inversion underline the complexity surrounding the strongly curved Hellenic arc. The Peloponnese segment is under an extension regime, but the way the slab-pull force is expressed, i.e., in balance or not with the subduction resistance, depends on the accepted dip for the slab. The stress inversion results derived for this sector support the concept of a possible N-S oriented slab tear beneath the Peloponnese. The slab tear model has been also observed in a number of different subduction zones (e.g., Miyoshi and Ishibashi, 2005). Meijer and Wortel (1996) used numerical modeling to suggest that the tip of the tear migrated southwards over time, and their model currently extends the detachment tear to a point in the southern Peloponnese. Suckale et al. 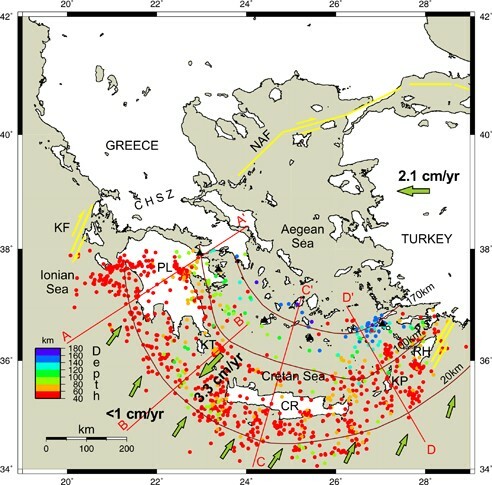 (2009) obtained high-resolution two-dimensional images of the sub-duction zone by deploying a temporary array of densely spaced broad-band seismometers that crossed the Peloponnese (from SW ∼21.6°E, 37.2°N to NE∼24.5°E, 38.8°N). These researchers also inferred a possible tear in the slab directly north of their array below the Central Hellenic Shear Zone-CHSZ (see Fig. 1). For the second (Kithira-Western Crete) and third segment (Crete), the σ1 axis is along the strike, and σ3 is almost sub-vertical to the slab. The orientation of σ3 unbalances the slab-pull force (negative buoyancy of the slab), which induces a vertical velocity on the slab and, most importantly, reduces the normal force acting on the plate interface, leading to slab rollback (Scholz and Campos, 1995). The results from previous studies have supported similar patterns for the intermediate-depth events in this region of the slab. Bohnhoff et al. (2005) also determined a subvertical orientation for σ3 (dip ∼ 70°) for this area, adding that slab pull is the dominant force within the subduction process and responsible for the roll-back of the Hellenic subduction zone. Stress inversion was initially performed on these two sectors together but led to a rather large misfit. The details of the stress regime differ for the two sectors, with confined extension present for the second sector, turning to confined compression for the third. The azimuth of the maximum compression for the second sector has an almost N-S direction; this has an E-W direction for the third sector. These observed differences in the stress regime may reflect a change in the slab’s curvature between Kithira and Crete, possibly a bulge or folding in the slab. Such a bulge has been observed in western Crete at around a depth of 60 km using teleseismic receiver functions (Knapmeyer and Harjes, 2000). The stress field for the fourth segment—that below Karpathos and Rhodes—has been divided into two depth ranges. The shallow part is characterized by slab-pull forces. The deeper subset shows that the σ1 slab is normal and that σ3 is parallel to the slab, indicating an extension regime. In this sector, strong heterogeneity is expressed at both depths by the large . Double WBZs have been observed in various subduction zones where the stress state of the slab changes from top to bottom (Kawakatsu and Seno, 1983). In the same manner, this stress regime, which changes from a simple slab pull to extension, might be interpreted by the presence of a DWBZ. The observed heterogeneity may be the result limitations in the dataset. In general, DWBZs have been described in areas where local seismic networks provide sufficient coverage to determine high-resolution earthquake locations. It is possible, therefore,that the lack of high-resolution locations along the Hellenic subduction zone hides the existence of a DWBZ and leads to the observed heterogeneity in sector 4. Two types of stress fields have been identified in the Nankai subduction zone (Xu and Kono, 2002); these have been explained by differences in the geometry and age of the subducting zone. The along-strike maximum compression observed in sectors 2, 3, and 4 (top 90 km) can be explained by the “tablecloth effect” or membrane strain model (e.g., Creager et al., 1995). According to this model, the slab geometry is analogous to a table cloth draped over the corner of a table, producing a slab with too much material (pleats in the table cloth) to fit around the corner, developing compressive along-strike membrane strains or geometric buckling. More data are needed in terms of precise earthquake locations and moment tensor solutions in order to shed light on the finer details of the slab’s geometry and stress variations along the Hellenic arc. 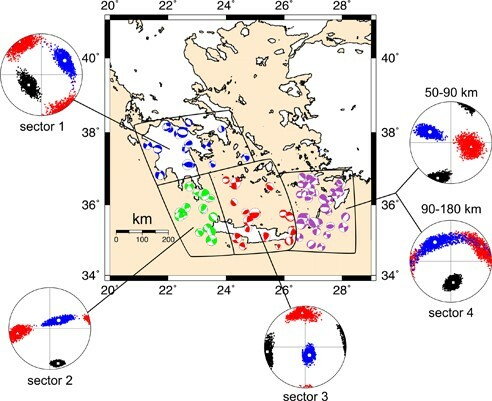 The Hellenic subduction zone can be divided from west to east into four sectors based on differences in the stress regime, slab geometry, earthquake depth distribution: (1) Peloponnese; (2) Kithira-Western Crete; (3) Crete; (4) Karpathos-Rhodes. The slab stresses in the Peloponnese sector are related to slab-pull forces and are consistent with a possible tear in the slab below this segment. For the second and third sectors, slab rollback is the mechanism able to explain the observed stress distribution, with the minimum compression almost subvertical to the slab. The differences in the relative stress magnitude and orientation of the σ1 axis between the Peloponnese-Kithira strait and western Crete may reflect changes in the slab’s curvature. The Karpathos-Rhodes area showed two distinct stress states for the top and lower depth ranges. The shallow part is characterized by slab-pull forces and the lower part showed a general extension regime. However, what is more prominent is the presence of stress heterogeneity expressed at both depths. A masked DWBZ might be able to explain this prominent heterogeneity and the stress regime that changes from a simple slab pull to an extension regime. This research was supported by the National Science Council (NSC) of Taiwan. The first author also holds a postdoctoral fellowship funded by the NSC of Taiwan.